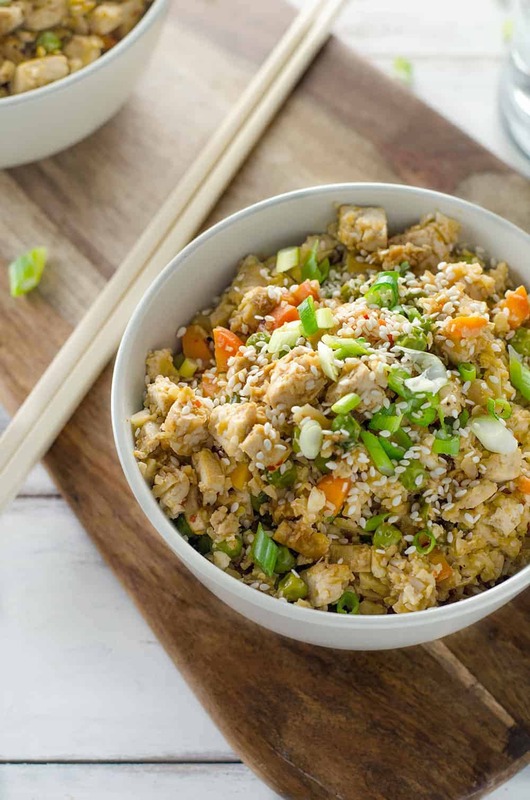 Easy Vegan Cauliflower Fried Rice! Ready in less than 25 minutes. Low-calorie, low-fat, low-carb and DELICIOUS! Vegan and Gluten-Free. I know it’s taken me a little over forever to get on the Cauliflower Rice train, but I’m here, I’m on and were going for a ride. To be fair, I was still getting over the previous decade’s obsession with turning cauliflower into mashed potatoes; a dish that will forever be associated with my mother, the South Beach Diet cookbook, and a disappointment that mashed cauliflower doesn’t really taste like creamy mashed potatoes. Now here we are, 10 years later and cauliflower is BAAAACK. I was a bit skeptical that finely ground cauliflower could actually taste like rice. Like, fool me once, shame on you. But fool me twice? I was planning for a similar experience to the infamous potato incident. Wrong. So wrong. Finely minced cauliflower stir-fried with crispy sesame tofu, vegetables and ginger-soy sauce is so incredibly similar to traditional fried rice I had to tell BL that he was eating cauliflower, without a grain of rice in sight. The same man who will pick out every tiny piece of kale in any dish I have ever served him was downing bowl after bowl of this cauliflower fried rice. So, picky husband approved and I’m assuming, 3-year-old toddler approved. Besides being a nutrient-dense, flavor packed meal, the entire dish comes together in less than 30 minutes. 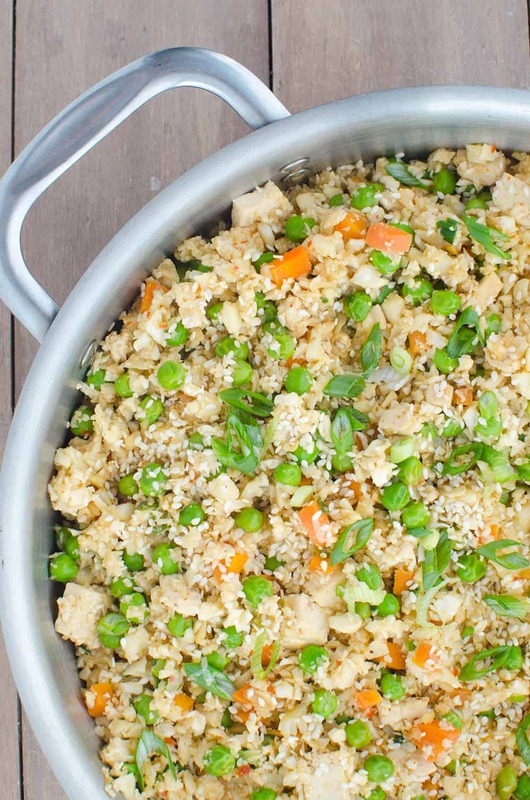 I know this cauliflower fried rice will be a regular rotation in our house. Fast, easy and healthy Chinese food –> ready, set, go. 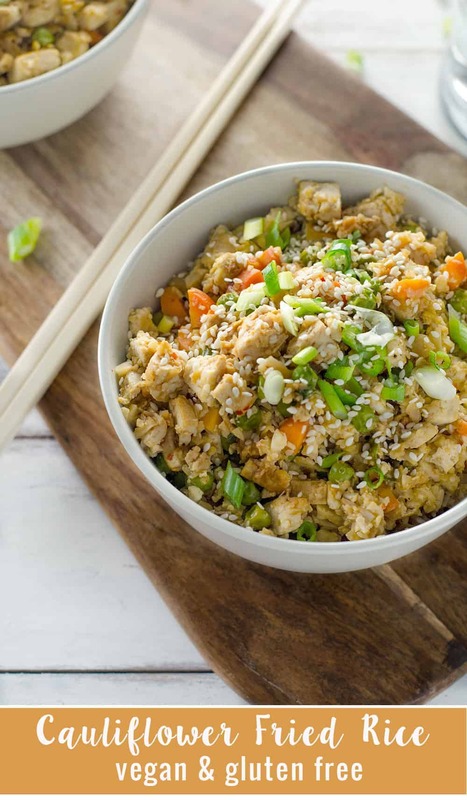 Easy Vegan Cauliflower Fried Rice! Ready in less than 20 minutes, low-calorie, low-fat, low-carb and DELICIOUS! Vegan and Gluten-Free. Lightly crumble the tofu in a large bowl and set aside. In a large wok, heat the sesame oil over medium heat. Add the ginger and garlic and lightly stir fry for 30 seconds – 1 minute until just golden brown and fragrant. Add in the crumbled tofu and stir-fry for 5 minutes, stirring often, until tofu is golden in color and cooked through. Remove tofu from wok and add the remaining 1 tablespoon of sesame oil. Add in the carrots and sauté until tender, about 2 minutes. Stir the peas, and cauliflower “rice” into the wok, mixing the ingredients thoroughly. Cook, stirring often, until the cauliflower is tender, 5 to 8 minutes. Stir in the cooked tofu, green onions, cashews and soy sauce. Garnish with sesame seeds, if desired. Cauliflower any way I love! It is it’s own and will never be “rice” or “potatoes”, but that’s fine because it still is one amazing food to use in so many dishes! Cauli-rice rocks! Can this dish be eaten cold? I want to take it to my Grandson’s! I think it tastes better warm, but I suppose you could eat it cold if needed. I love cauliflower rice (except for the mess it makes when I pulse it)! It’s so great in “fried rice” and I love your version with the tofu. 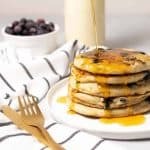 Definitely adding this to my menu plan asap! Cauliflower rice is the best, I love that you can make it so quickly and easily! 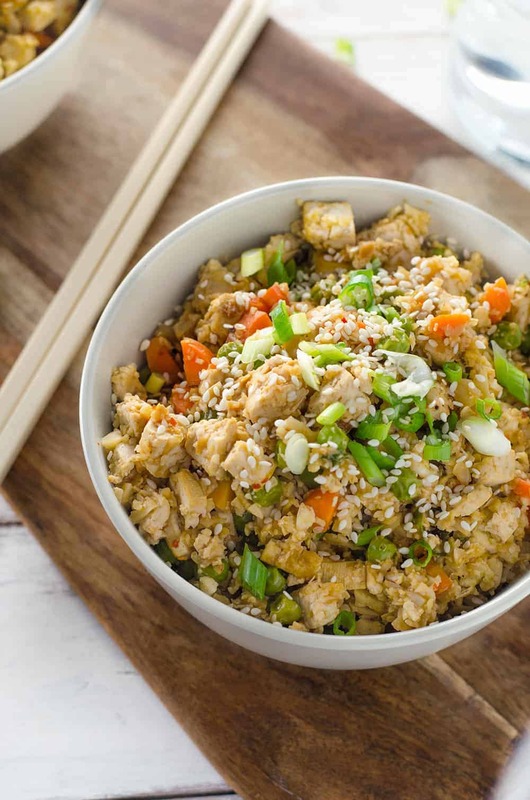 I’m new to healthy eating, trying to break my 48-year habit of sugar-addicted bingeing, and I found your recipe for the cauliflower fried rice online. We tried it last night and I was really, really happy with the results. I didn’t feel like I was compromising on taste, which is usually the case when I eat healthier. Thanks for putting so much creativity into your work and for sharing your culinary talents! Thanks Leigh! Thanks so much for the comment! This is delicious. BUT, I take issue with your time estimates. Having made this twice now, I can attest that this takes 50-60 minutes to prep and cook. Ricing the cauliflower takes 10 minutes on it’s own. You need a lot more than 5 minutes to prep the garlic, ginger, scallions, tofu, carrots, and peas. And I say this as an experienced cook. BUT, it really is delicious. As long as you have an hour, it’s fantastic. How many carbs does this dish have? Calories? 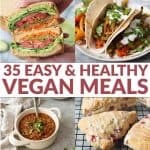 Could I use Tempeh substitute for the Tofu, or is there another ingredient better suited? Hi Ameena, sure! I don’t see why you couldn’t use tempeh instead. one more question do you know the serving size? Would frozen rice cauliflower work? It should, might be more watery, so adjust as you need to for cooking time. Come back and let us know! It turned out great!!!! I adjusted the cooking time like suggested, and I had no problems with the consistency in the finished product! My family loved it! Thanks!